Occasionally Japanese maples, roses, bamboo (especially bamboo!) and other large container plants need to be re-potted. How can you tell if it’s time? If you feel that a particular plant didn’t do so well last year, or that water ran right through the pot without being absorbed, then it probably is. Repotting doesn’t always mean going to a bigger pot. It could just be a case of trimming the roots and replanting into the same pot using fresh soil. Handling big pots is easier than it looks if you know a few tricks and have someone to help. A day or two ahead of time check the moisture in the containers. It’s easiest to do if the soil is damp right through, but not soggy. The easiest is premixed potting soil that has a soil base – avoid light weight peat- based mixes. (We like Growell Sterilized Potting Soil). Alternatively, you can use a bagged soil like Grower’s Delight Garden Soil mixed 50/50 with bark. If you prefer to mix your own soi, a blend of equal parts finished compost, bark mulch and good garden soil is ideal. N.B. Its best to always use sterilized soil for Japanese Maples, as garden soil can harbour harmful fungal spores. Time to get started! Make clean-up easy by spreading out a tarp to work on. Run a long, sharp knife, like a bread knife, around the sides of the pot. When it seems loosened, lay the pot on its side and carefully pull the plant out. This is easiest if the container has straight sides, but will take much more effort if the sides are curved inwards (a good thing to remember if you are buying new pots). You don’t have to be too gentle at this stage, especially if the plant is dormant. Plants are tougher than you think. 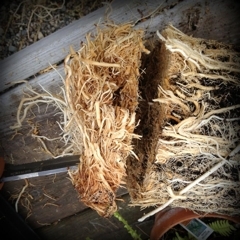 Tease the soil away from the roots with a small hand fork and trim long circling roots. If the root mass is solid, use an old knife, pruning saw or even a Saws All, to cut away a couple of inches from the sides and bottom. Clean out the container and check that the drainage holes aren’t plugged. Cover them with some screening to keep them open. Mesh dry wall tape or old window screen work well. 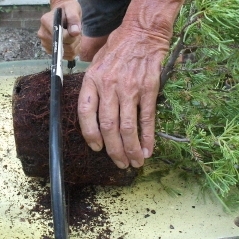 Add fresh soil mix to the pot and reposition the plant so that the top of the root ball is at the same level it was before you started- not too deep or too high. Fill in with the soil mix, to about two inches from the top. 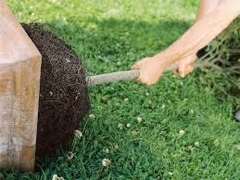 Tamp the soil down gently around the roots so there are no air pockets. Return the pot to its permanent position. Top dress with a slow release fertilizer and water well. Lastly, prune for shape and to remove any damaged or inward growing branches. If your containers are too big to move, scrape away what you can of the old soil and top up with some fresh soil mix instead. .
It’s possible to re-pot anything if you have enough help! 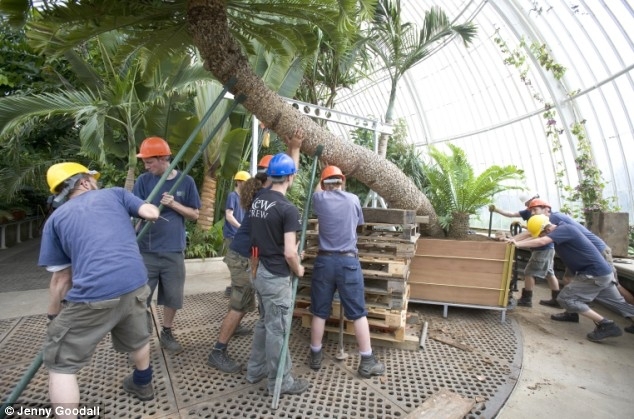 It took nine gardeners, a crane and three months of meticulous planning to place a one-tonne tree, believed to be the oldest potted plant in the world, into a new container. The ancient cycad, a palm-like tree, was collected from South Africa on one of Captain Cook’s voyages and has been at Kew Gardens since 1775. It has grown outwards and upwards at an inch a year and now reaches almost 15’. It grows at an angle and is propped up by stilts.